Madrid offers a plenty of Christmas activities and attractions so that you could have holidays full of joy. The tourist bus Madrid City Tour gives you some suggestions for visits to enjoy an authentic Christmas experience. The traditional market on the Plaza Mayor this year surprises its visitors with a new design. In accordance with the Christmas spirit, the chalets are painted in red and are beautifully illuminated from inside and from outside. There you can find all type of presents and Christmas items like Belen figures, decorations, trees, typical musical instruments, toys and even party tricks for the most dared. The tradition of decorating the city with original and pleasing nativity scenes continues in foot during these holidays. One of the most famous and popular nativity scenes is the one located on the Puerta del Sol. This year the ¨Belén de Sol ¨ is dedicated to Carlos III. He was the monarch who developed and promoted Madrid during his reign. 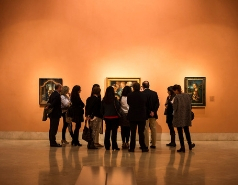 There may be observed not only the traditional scenes like the ¨Annunciation to the Virgin ¨ and the ¨Adoration of the Magicians¨, but also you can contemplate emblematic monuments and buildings of Madrid. All this is distributed in 150 sq. meters. Other funny activity that you can enjoy during these days in Madrid, is the ice skating. In December Plaza Colon, one of the most emblematic squares of the Spanish capital, is converted in a huge ice skating ring. Also there are many other attractions like the magic forest with a wide variety of cultural and leisure activities, shows and workshops. 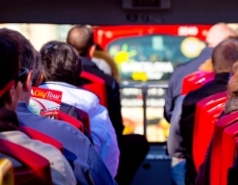 To go to these places, get on board of the panoramic bus tour Madrid City Tour, take advantage of the hop on hop off service and visit all on your own pace. 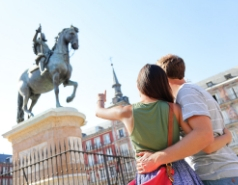 To get to Plaza Mayor, take the route Historical Madrid and get off on the stop nº16 Plaza Mayor. To get to Plaza Colón take the route Historical Madrid and get off on the stop nº17 Puerta del Sol or take the route Modern Madrid and get off on the stop nº15 Puerta del Sol. To get to Plaza de Colon take the route Historical Madrid and get off on the stop nº4 Plaza de Colon or take the route Modern Madrid and get off on the stop nº3 Plaza Colon. Madrid City Tour wishes you happy holidays!